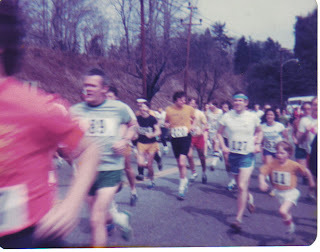 March 11th, 1978 was my initiation into racing and a major turning point in my life. Prior to that day I was just running for general fitness and was more interested in trying to put some muscle on this skinny frame. think I weighed in at about 132 pounds in this picture. You have to love the outfit and the large paper number. And dig that mustache. So anyway, I was running about 10 miles a week with maybe a couple of weeks that I ran 13 and 15 miles. I had run one 5 miler in December on the track with my boss just to see if I could go that far. We did that run at exactly 8mp. I was aware of the Olympics and the Boston Marathon but had just recently learned that there were actually "fun runs" open to regular people and that you didn't have to be an elite athlete to participate, so when I saw they were having one in Winston Salem I decided that I would like to try it out. I had no idea what I was doing and knew no one to ask for advice so two days before the race I did my 2nd 5 mile training run. We got up early Saturday morning for the 2 hour drive to Winston Salem and search for Hanes Park where the race was to be held. We got directions at a gas station after arriving in town and soon found our way to the Park. It was a beautiful morning in the 50's with the high eventually reaching the mid-60's. I was surprised at the wide range of runners milling around. Mostly men but there were several women and quite a few older men( kind of like me now). I was nervous and a bit intimidated by the whole thing so I found a spot in the middle of the pack as we lined up on the street. I wasn't too happy to see that we would start on a hill and that the first mile would be all uphill. What follows is taken from my running journal entry for that day. Between miles 1 and 3 my hill training began to show. There were several short, gentle hills and I kept up my pace and actually began passing about half the people I would pass in the race on these hills. I made a mistake and grabbed a cup of water and tried to swallow on the run. It messed up my breathing and all of a sudden my stomach hurt and I felt tired. It took me until mile 4 to get back into my rhythm and feel good again. Miles 3 to 5 were nearly flat and straight and I began to feel stronger and confident after my stomach felt better again at mile 4. 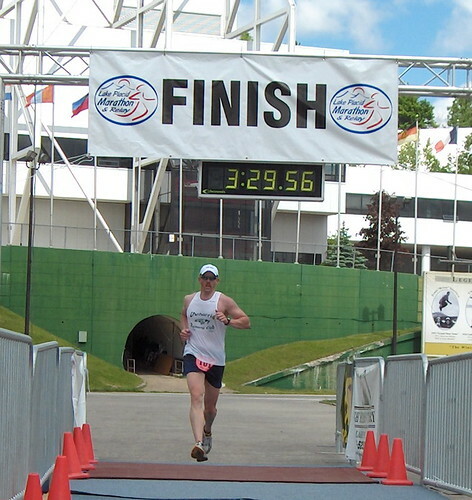 From that days experience, I was hooked on racing and running and my interest in body-building was replaced with dreams of pr's and future races. Great story Joey...I only hope I can achieve the same longevity. Good blog. 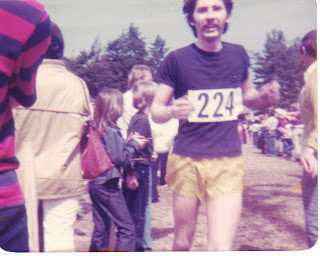 I ran that race at Hanes Park in about 1983- a 10 year old then. I was reading your report on Gator Trail 50K. I'm planning on running it next week. Rocky Raccoon will be my first 100 miler and while the terrain isn't my favorite, pictures from these two races seem similar. Is that a fair assessment?